The last two weeks of November we immersed ourselves in Barcelona. Our apartment in Barceloneta made our stay very special. From our comfortable “home” we toured all over Barcelona for the first two weeks of November. All by foot or Metro. 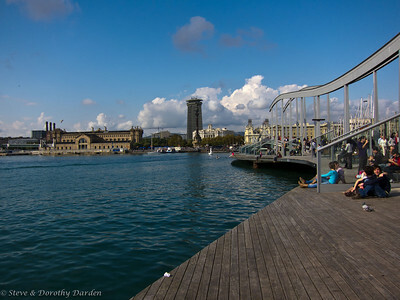 The Barceloneta neighborhood is populated with numerous shops and services — for almost any need, you need not leave the neighborhood. But if you are a shopper, the classy seaside mall of Maremagnum is only a 20 minute walk. Barcelona is a walking and bicycling city. We rented bicycles from the friendly shop near the Mercat. Even better would be a membership in the Barcelona community bicycle program (see www.bicing.com or Wikipedia http://en.wikipedia.org/wiki/Bicing). Our research concluded that the wonderful Bicing program membership is only available to residents (due to protests by rental shops). Hopefully that will change. 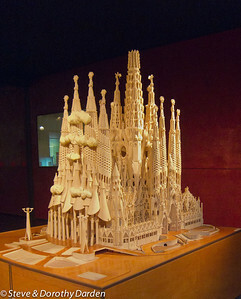 We cannot imagine what Gaudi might design today if he had access to modern computer-aided design tools. But Gaudi didn’t even have a mechanical calculator. So graphical calculations were his workaday tool. Almost all of Gaudi’s drawings and models were destroyed by mistreating and looting of the Spanish Civil War. What we know about his designs and methods has been reconstructed from the few remaining photos, notes and fragments of physical models. The Gaudi museums at the Sagrada Familia and the Casa Milá (La Pedrera) have assembled wonderful exhibitions that give us perspective on how Gaudi worked. 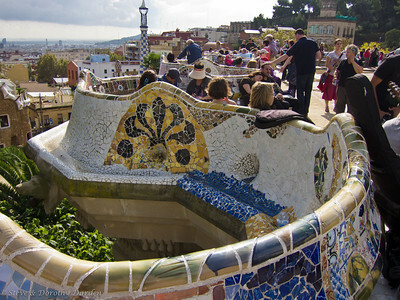 One outstanding example are Gaudi’s clever physical form-finding methods. For catenary arch designs, Gaudi developed the hanging-chain funicular model in depth for his Colònia Güell chapel project. The image below is an inverted photo of the detailed reconstruction of the Colònia Güell model. The actual model is, of course, hanging “upside down”. Inverting the photo makes it easier to visualize the catenary arches as built. 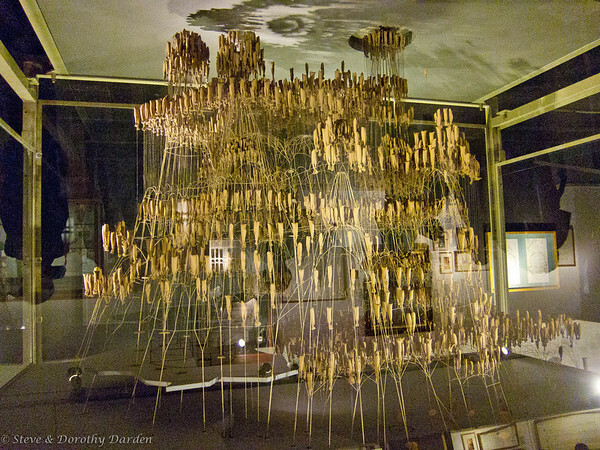 Gaudi constructed these models over a mirror so he could visualize the actual building as he worked. This method exploits the property of a catenary curve, which describes a chain in pure tension. When the catenary is inverted it becomes a curve in pure compression. Gaudí always chose the simplest path when it came to making the calculations for his projects. At that time, with no calculators or computers, a good graphic calculation was more efficient that a pile of papers of calculations with analytical operations. But that was the most trodden path. Gaudí distanced himself from his contemporaries’ way of doing things and went beyond that phase of the graphic calculation and on to empirical experiments with hanging models with weights and strings, a system which no other architect in the world had ever developed to the degree and on the scale which he did. Catenary systems have been used for construction in Catalan areas of Spain for a long time. For example, if a Catalan stair has to be constructed it is not detailed by the planners or architects. Instead, the masons on site hang a rope between the point of departure and the point to be reached, trace the shape and flip the curve over to use as the guide for constructing the masonry arch that carries the stairs. The rope is in pure tension, as it can not take any compression due to its flexibility. Therefore the form it finds contains the pure tensile force within the envelope of the string. If one inverts the parabola, one gets a pure compression arch which is necessary for brick construction, which cannot take any tensile forces. A one minute video demonstration of CADenary (fun). A CADenary web applet — you can try out your own simple designs. Axel Kilian and John Ochsendorf Particle-spring systems for structural form finding published in IASS VOL. 46 (2005) n. 147. A virtual visit to Church of Colònia Güell . Nothing can prepare you for your first experience of the Temple Expiatori de La Sagrada Familia. At the Nativity facade entrance, the outside appears aged and autumnal and intricately sculpted. Upon entry, you find yourself surprised by the brilliance of a towering sacred forest, lit as if through leaves from above and through stained glass windows from all sides. 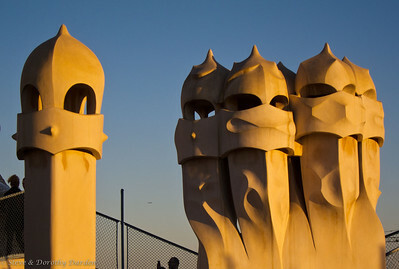 The influence on Antoni Gaudi, the architect, of the natural world is striking both inside and out. As a boy he showed a strong interest in shapes, colors and the geometry of nature. He learned copper smithing from his father. At the age of 36, having earned his architect’s diploma only five years earlier, Gaudi was commissioned with the continuation of the work on La Sagrada Familia. 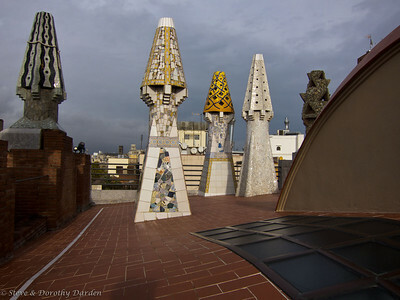 In addition to that responsibility, Gaudi completed numerous other major projects over the following years during which he developed his unique architectural style and technology. At least six of these buildings have been granted World Heritage status by UNESCO. Beginning in 1914, Gaudi devoted all of his time to La Sagrada Familia, until his death in 1926. During the last years of his life, Gaudi planned many parts of the church so that they could be built in the future. He did this by combining geometrical forms and performing structural experiments and calculations. Since the outset 129 years ago, the La Sagrada Familia has been built from donations, always respecting the will of the architect’s original design and models. 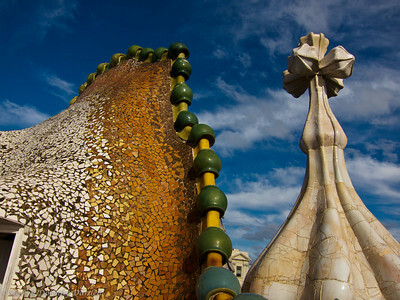 Gaudi used the architectural structure as well as the decorative images to express the symbols of Christianity. 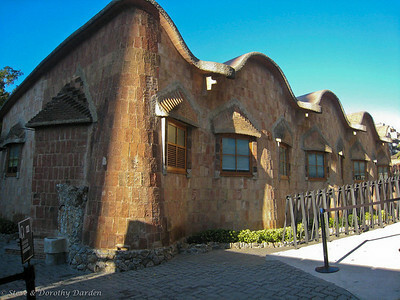 It is very easy to see examples of Gaudi’s catenary arches constructed in brick at this interactive 3D panorama of the attic, Gaudi museum. There is also a kubic virtual tour.